(Saturday, November 3, 2018) – Normally this article is reserved for our City Manager who keeps us informed on capital projects and future innovative developments currently in the planning stages, which makes this a world class and cutting-edge community. This month the manager graciously gave his article space to the police department, so we could discuss other factors that also affect the status of our community. One of the biggest concerns to date is ‘safety’ from a traffic perspective. The safety of our community will always be the top priority of the Sunny Isles Beach Police Department on all levels. However, when we talk about traffic safety, the police department is only one component as we have many other stakeholders who each have a different responsibility to ensure our roadways are up to standards and work in conjunction with Miami-Dade County Traffic Control, who coordinate the signalization of intersections and pedestrian crosswalks. Each of these components, despite their complexities, have one major thing in common; traffic safety! 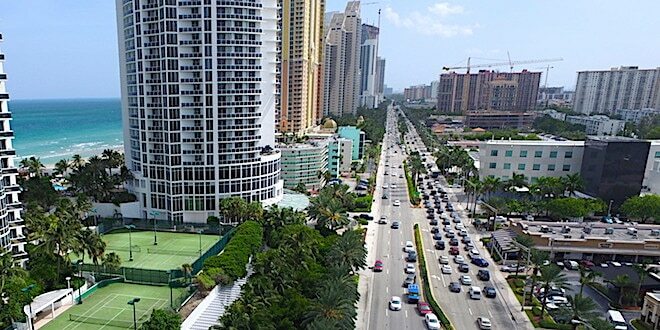 Most recently, the Florida Department of Transportation is finalizing the restoration of the state roads, which run through our City, including Collins Avenue and Sunny Isles Boulevard. The scope of this work was complicated and multi-faceted, which included the installation of new handicap accessible curbs at all intersections, several new and updated crosswalks for pedestrian safety, and the complete resurfacing and lane striping of Collins Avenue and Sunny Isles Boulevard. All of this work, when completed and combined with our already outstanding local roads, will provide the type of roadway system consistent with other modern communities. Other improvements are designed to relocate some of our local bicyclists and pedestrian traffic off of busy Collins Avenue and on to our local roads. Thanks to the vision of our elected officials and City staff, the City of Sunny Isles Beach recently completed a beautiful pedestrian bridge, which traverses an Intracoastal canal, connecting North Bay Road between 174 and 172 Streets, as well as an overhead pedestrian bridge over westbound Sunny Isles Boulevard. Several other overhead pedestrian bridges are currently in the discussion stages, all with one thing in mind, providing the safest possible environment for our residents and guests to enjoy all of the amenities our City has to offer. Lastly, with the many safety advancements discussed, the most important component to keeping our community truly traffic safe belongs to you, our residents and guests who utilize our roadways and sidewalks on a daily basis. The police department has the ultimate responsibility to enforce traffic laws and to educate motorists when they commit infractions but driving/walking safe is your responsibility. The reasons for traffic crashes are many, but a lack of attention by motorists, not following the rules of the road, is dangerous and cannot be tolerated. There are many tips pedestrians can follow to stay safe. See below for a listing of these. In closing, this is our community and the police are committed to protecting at all costs, but we need you to set the example by following the rules of the road. “Drive safe/walk safe,” so everyone arrives alive! Be alert as you walk. In addition to vehicular traffic, a pedestrian must be aware of bicycles, scooters and electric cars that operate very quietly as well as stationary objects like fire hydrants, bus shelters and meter covers. Use all your senses to stay safe.